Are you a Yoga instructor, Kirtan Lover, Yogi, Yogini, Chanter or Indian Music lover? Do you want to learn more about Kirtans and Indian Ragas to deepen your Yoga Practice and meditation? Do you want to know how Kirtan, Indian Ragas and Nada Yoga are related? or how certain ragas are associated with certain Chakras? 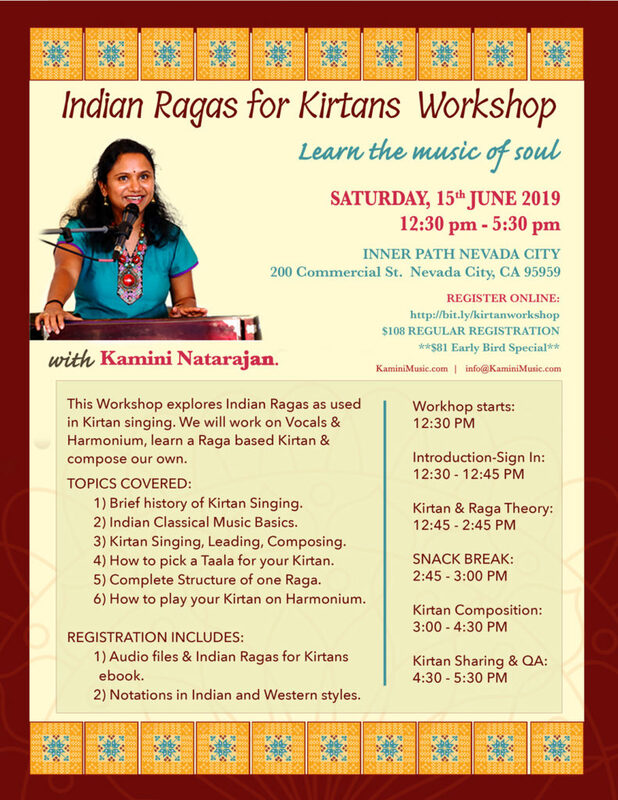 Indian Ragas for Kirtans workshop is a 5 hour intensive workshop designed to give you an understanding of why and how of authentic Kirtan singing. We will explore brief history of Kirtans, learn about Indian Ragas and learn a Raga based Kirtan along with composing our own. I am offering this workshop for $108. You can also score a big discount by pre-registering. Pre-registration is ONLY $81.